It’s Mr. Wonderful — Phil Davis UFC 123 Walkout Shirt by Dethrone!I have actually never seen a guy control another human being in the way that Phil Davis manhandled Tim Boetch at UFC 123. Not only that, he also pulled off a submission that I have never seen before, dubbed as the “Mr. Wonderful”. It’s a variation of the kimura, only pulled from the back. That was an amazing fight to watch as it was a testament to human potential. And guess what Phil Davis was wearing? Other than his pink vale tudo shorts, (which I’m still trying to get a hold of) he was rocking the Dethrone Phil Davis UFC 123 Walkout T-Shirt! This performance-fitted shirt (meaning both useful in and out the gym) features mill dyed prints including the famous Dethrone slogan, “Defeat thy rivals, demand their respect”. 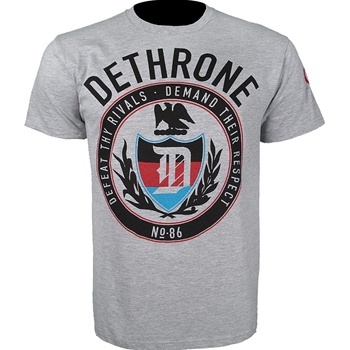 Available at MMAWarehouse for only $28.